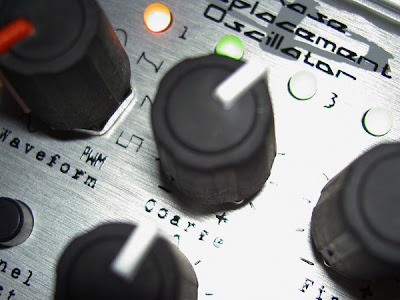 Audio examples and review of the WMD Phase Displacement Oscillator. A sequel to this post. The sounds in the multi-tracked demo track were generated by modulating the PDO either by itself, for wave-shaping, or an external VCO for PM effects. Buy the EP to access the full set of unprocessed demos (10 recordings, 30 mins duration). As you can hear, the PDO is capable of a wide variety tones: deep acid basses, bright bells, wooden klonks, scraping steel strings, rasping super-saw/ PWM sounds, even digital noise. As with the Zeroscillator, panning two phase shifted outputs hard left and right can result in stunning stereo effects. I found I could push the PM index harder and get brighter sounds than with either the analogue ZO or digital Hertz Donut. Like thru-zero linear FM, when the PDO is modulated with a bi-polar signal, its sign, or direction, changes. However, modulating the phase rather than the frequency results in less pitching artifacts. That's not to say the PDO is artifact-free. At slower modulation rates I thought I could see/ hear the PDO 're-calculating' the phase offset, resulting in a mild siren effect. I asked William about this and he explained that this was the nature of phase modulation; what I was hearing was similar to the Doppler effect where moving the phase forward increases the frequency. At higher audio rates this was not apparent, but it might have an effect when using the PDO as an LFO. The digital wave-shaper means aliasing is apparent and the sound can break up at extreme frequencies or when FM-ed hard. However, I took this to be part of the PDO's character and, as you can hear in the demo track, it means you have another set of timbres to play with. I thought the saws and pulses were not as beefy as an analogue VCO and that it was a shame that one can't affect pulse width and phase simultaneously for 'shonky beats'. However this can be addressed by routing a shifted output to the reset input via a clock divider. These are minor points given the wealth of sounds and possibilities packed into the PDO's 10HP. In fact, that would be my biggest criticism: it's pretty cramped! I'm sure I'm not the only one who'd gladly devote more rack space to a larger PDO, possibly with an onboard sine modulator and index VCA. As it is, the list of modules the PDO could replace in my system is shocking - it's perfect for a live set-up or desert island suitcase. There is one last thing to consider: at almost €400 the PDO is in the same price category as the SynthTech E350 and Cylonix Cyclebox, which both offer increased fidelity. Whether they offer the same depth of phase modulation and character is something I look forward to testing in a future post. Thanks to William for taking the time to answer my questions and for a great module!